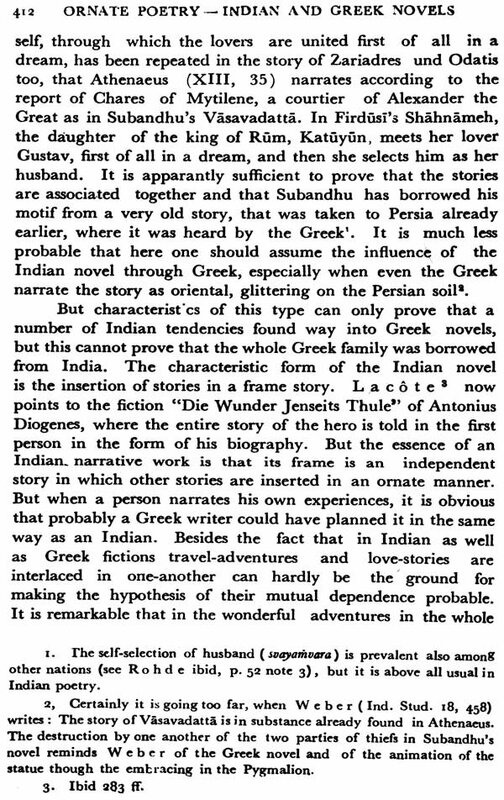 Winternitz's major work was Geschichte der Indischen Literature (History of Indian Literature). The first volume was published in two parts in 1905 and 1908. 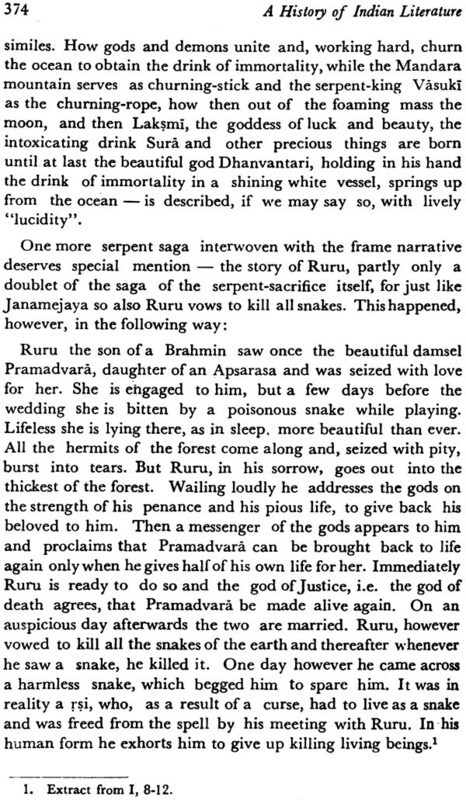 It dealt with Vedic literature, the epics and the Puran- as. 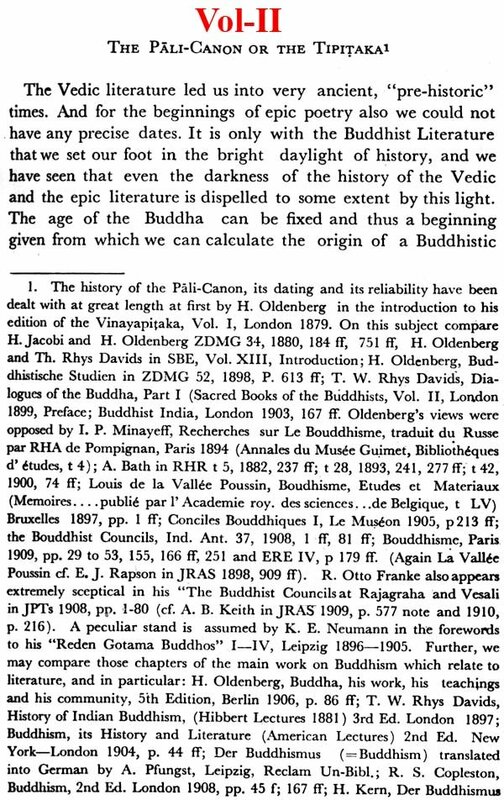 The second volume on Buddhist and Jain literature appeared in two parts, in 1913 and 1920. In the last volume, Kavya literature and scientific literature found a representation. A bird's eye view of the vernacular literature of modern India completed that volume published in 1922. The value of the work was enhanced by copious notes. The English translation was revised by Winternitz himself. The first volume was published in Calcutta in 1927, the second in 1933. The treatment of Buddhist Sanskrit literature in the English translation represented a new edition. Winternitz died before the third volume could be revised. Volume I is divided into two sections. 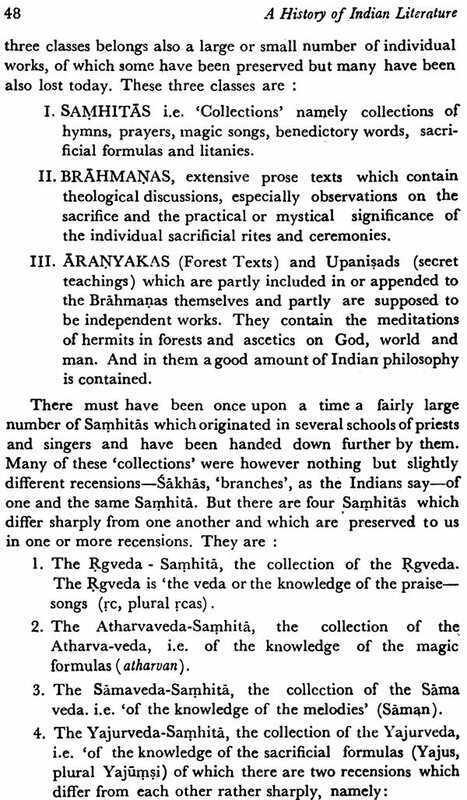 Section I relates to Veda (the Four Samhids), B .rahmanas, Aranyakas, Upanisads, Vedaligas and the literature of the Ritual. Section II relates to the study of two great Epics of India—the Ramayana and the Mahabharata. 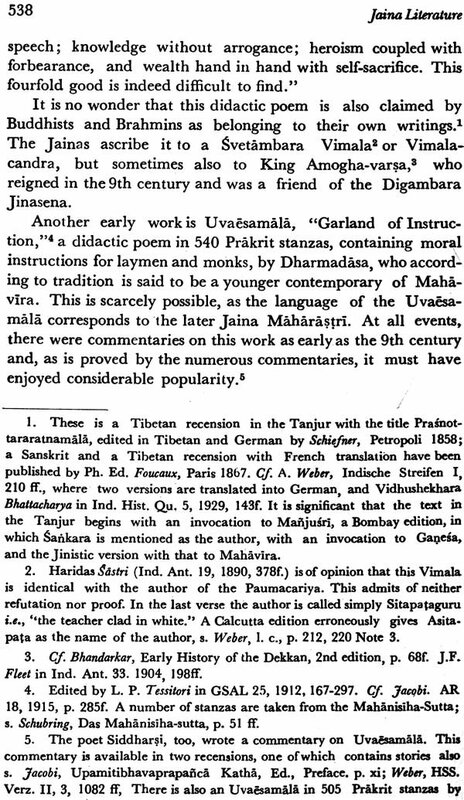 It carries out a general survey of the Puranic literature, and provides ample information about the Tantras too. Volume II contains two sections, viz. Section III and Section N relating to Buddhism and Jainism literature respectively. Volume III covers the history of Classical Sanskrit literature and the Scientific literature with its characteristics, grammar, lexicography, philosophy, dharmasastra, architecture, sangitasastra, kamagastra, ayurveda, astronomy, astrology and mathematics and also has an appendix. MAURICE WINTERNITZ : (December 23, 1863 -January 9, 1937) was a German Orientalist, who received the Ph.D. in 1886 from the University of Vienna. In 1888 he went to Oxford, where until 1892 he assisted the preparation of the second edition of the Rg-Veda (4 Vols., Oxford, 1890-92), collating manuscripts and deciding on the adoption of many new readings. Winternitz remained in Oxford until 1898, acting in various- educational capacities, such as German lecturer to the Association for Promoting the Higher Education of Women (1891-98), librarian of the Indian Institute at Oxford (1895), and frequently as examiner in German and Sanskrit both for the university and for the Indian Civil Service. 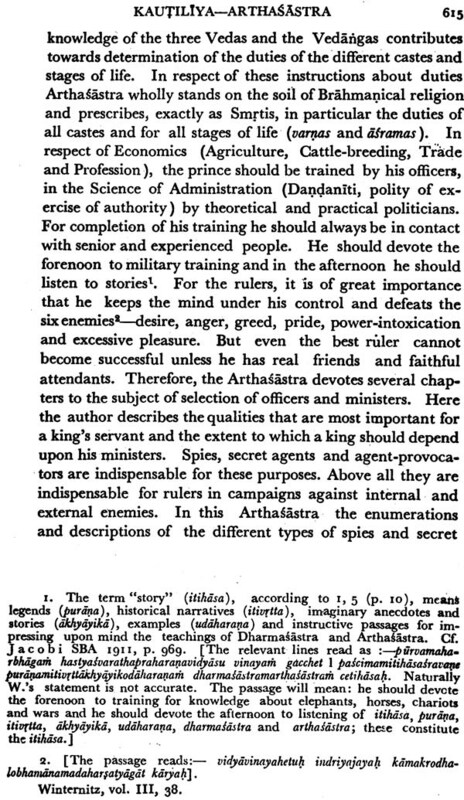 In 1899 he went to Karl-Ferdinands-Universitat in Prague as privatdozent for Indology and general ethnology, and in 1902 was appointed to the professorship of Sanskrit and of ethnology. As the publishers have announced in their notice, the collection of works in which the present volume devoted to the oldest period of Indian Literature appears is meant not for scholarly circles but for all educated people of the nation. Accordingly, always in the course of my work I was having in mind such readers as know nothing of Indian literature and do not have any special knowledge of the subject of Indology; I however did not think of those people who would also like to know something about Indian literature in the course of one short hour; but I had in view those people who would like to get such a thorough acquaintance with it as is possible without a knowledge of Indian languages. 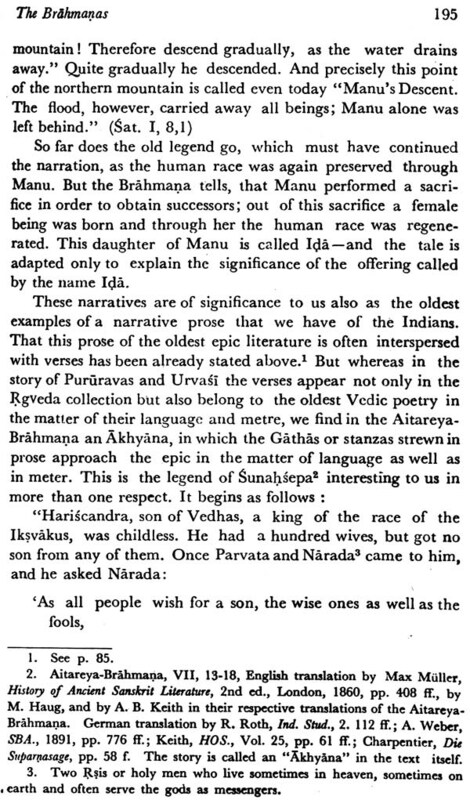 But a history of Indian literature cannot be, like a history of German, English or French literature, a simple presentation of the development process of already known literary works, but it must also give as much information as possible about the contents of literary phenomena through extracts and synopsis in all cases where there are no German translations, and this is so in a majority of cases. In other words-the History of Literature must be at the same time also the description of Literature. Especially in the case of the popular epics and puriir.zas, with which the second half of the present volume deals, very few have appeared till now in German translations. Comprehensive synopsis and extracts have therefore had to be provided, if the reader should get even a faint idea of the works dealt with. Consequently the volume grew to a larger extent than was originally planned. One more factor contributed to this. 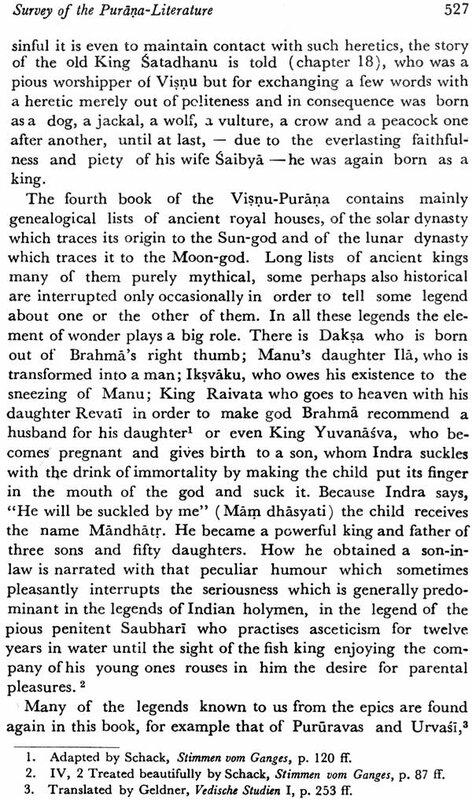 In particular the oldest Indian literature treated in this volume is in a way hanging in the air. 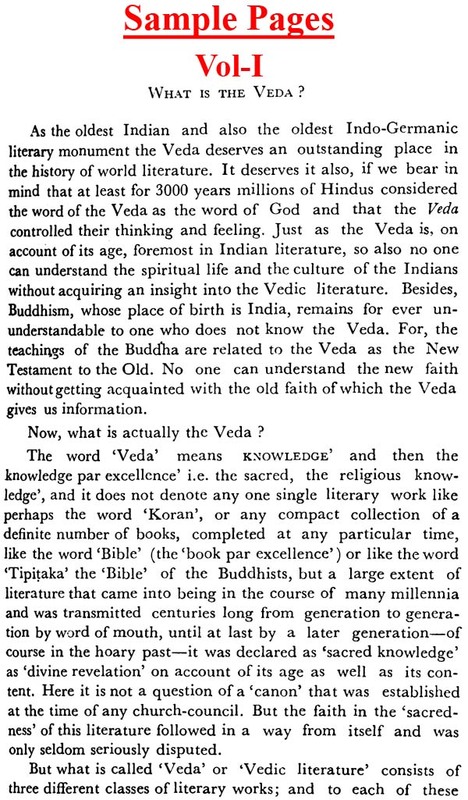 Not even one of the many and extensive works which form part of the Veda, of the epics or of the puriir.zas, can be attributed with any degree of certainty to one century or the other. It is however simply impossible to give information about the age of the Veda, the Mahabharata, the Ramayana and even the Pursnas. Even the layman will not be satisfied if we say that we do not know anything definite about the time of these works. It is necessary to draw clearly the boundaries within which our ignorance ranges and to state the reasons supporting an approximate fixation of time although this was attained only through presumptions. 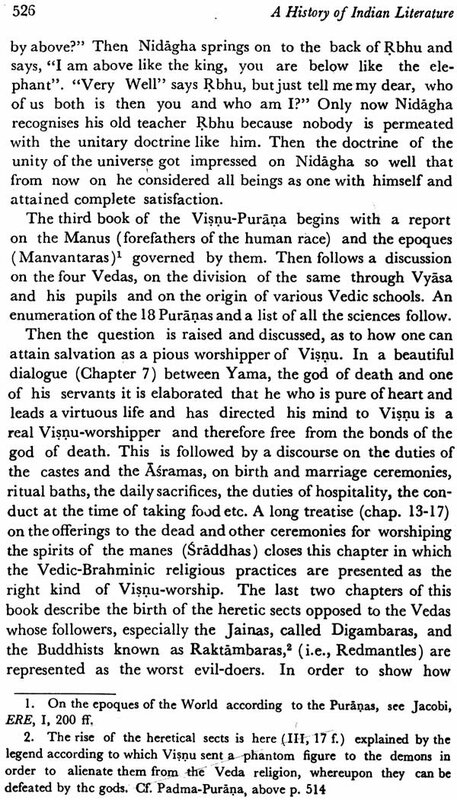 So it was necessary to devote more extensive chapters to the questions of the are of the Veda, the epics and the Purdnas. I emphasise particularly that these chapters too are written not for the specialist alone but mainly for the layman above described, whom I had in view as my reader. If in spite of this they contain something which is new even for the specialist-perhaps something which could even provoke contradiction-then the reason is that they deal with questions which have been in recent years objects of new investigations, new discoveries and several controversies. The bibliography furnished in the notes is meant for the specialist whom it shall convince of the correctness of the author's stand on the most important issues under dispute of course a book written for the 'Educated people of the Nation' should stand the test of the specialist and should be subjected to it thoroughly. On the other hand, in my notes for the layman I thought it important to draw his attention to all the accessible German translations and where these are not available, to the English and French translations. I have made use of these translations only in a few cases, where they appeared to me to produce the original in an excellent manner. Where no other translator's name is mentioned, the translations are by me. 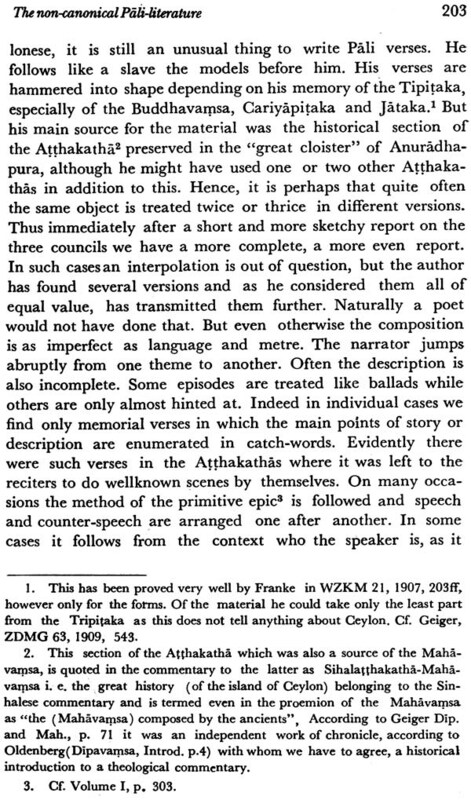 After these explanations it is not surprising that the original frame of work conceived for one volume was found to be in- adequate for this History of Indian Literature. And I am indeed grateful to the publisher that he was convinced of the reasons adduced for enlarging the framework originally planned and gave his approval to a second volume. 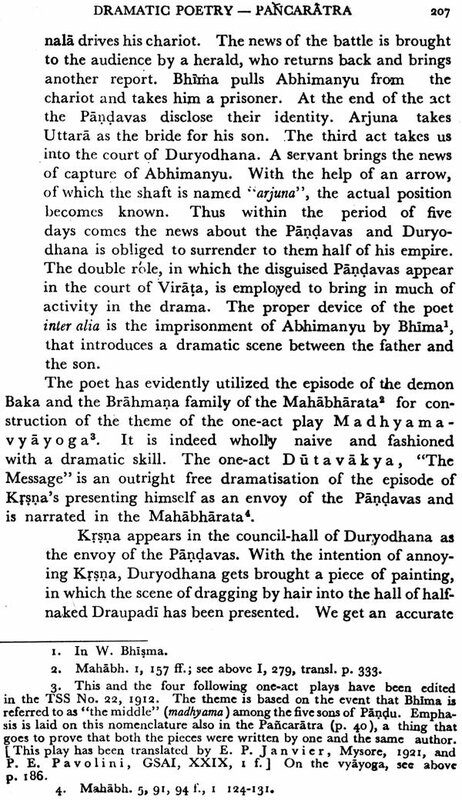 This enlargement entirely corresponds with the extent and significance of the Indian Literature-for which I may draw my readers' attention to the Introduction (p. 1 ff). While the present volume treats in a certain way the 'Prehistoric' time of the Indian Literature,-at least the beginnings of the Veda as well as the popular epics reach back to a hoary past shrouded in obscurity incapable of being reduced to definite dates-the second volume shall begin with the Buddhistic literature and introduction the reader to the literature of the actual historical time of India. The history of Indian literature is the history of the mental activity of at least three millennia expressed in speech and writing. 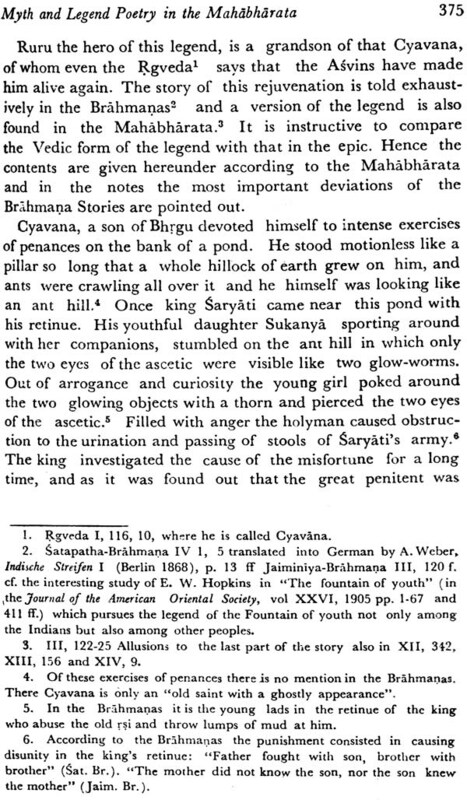 And the place of this mental activity continued uninterrupted through the millennia in a country which extends from the Hindukush to the Cape Comorin and covers an area of one and a half million square miles, equal in extent to the whole of Europe excluding Russia-a country extending from gON to 35°N, thus stretching from the hottest equatorial regions right into the temperate zone. 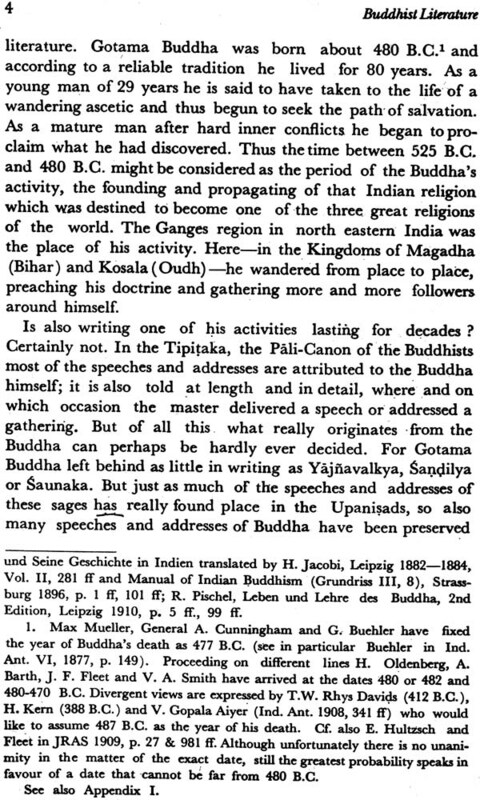 The influence that this literature exercised over the intellectual life of other folks even in olden days however is felt far beyond the frontiers of India and (Further India) , in Tibet as well as China, Japan and Korea and in the South in Ceylon and the Malayan Peninsula and further beyond in the island groups of the Indian and the Pacific oceans, while in the West we find traces of Indian intellectual life in places reaching deep into Central Asia and East Turkistan, where Indian manuscripts were found buried in the sands of the desert. In content Indian literature comprises everything which is included in the word 'literature' in the broadest sense of the term : religious and mundane, epic and lyric, dramatic and didactic poetry as well as narrative and scientific prose. In the forefront we find religious literature. 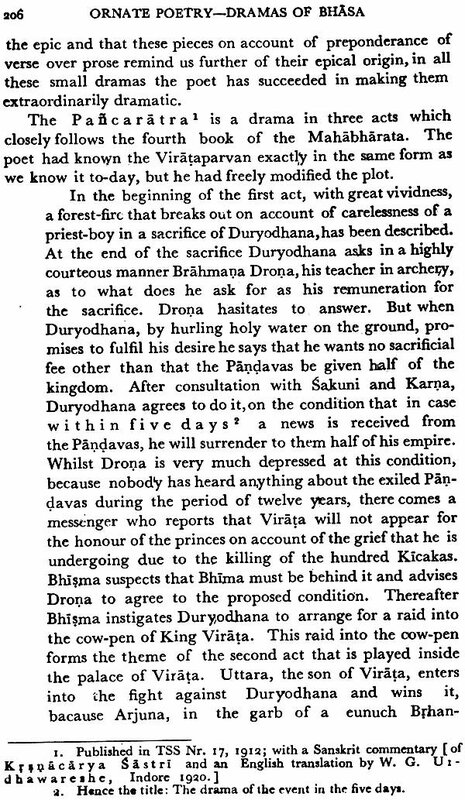 Not only the Brahmins in their Veda and the Buddhists in their Tipitaka but also many other numerous religious sects that have appeared in India have on record plenty of literary works-hymns, sacrificial songs, magic songs, myths and legends, sermons, theological treatises and polemic writings, text books of rituals and of religious order. In this literature is found heaped up material of inestimable value which cannot be ignored by any scholar of religion. In addition to this activity in the field of religious literature begun thousands of years ago and being continued even till the present day there have been in India even in ancient times songs of heroes which in the course of centuries got condensed into two great popular epics- the Mahabharata arid the Ramayana. These sagas were the sources which supplied material for centuries to the poets of India in the Middle Ages and works of epic poetry were thus born which are termed artistic epics in contrast to those popular epics. Although these works of epic poetry with their excessively exaggerated artistry are often not to our taste, still their authors have left us works of lyric and drama which can be compared with the most beautiful creations of modern European literature by virtue of their delicacy and fervour and also of the power of dramatic formation. 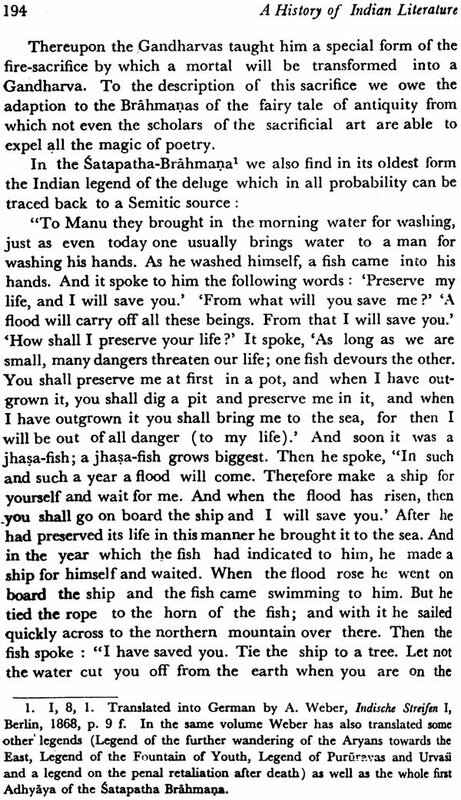 And in one field Belles Lettres, in the field of aphorisms (epigrammatic poetry) Indians have achieved a mastery which has never been achieved by any other folk: India is also the land of fairy tales and fables. Indian collections of fairy tales, fables and tales in prose have played no small role in the history of world literature. Indeed the research into fairy tales - such an attractive study of fairy tales and of the pursuit of the motifs of fairy tales in their wanderings from folk to folk - has developed into an independent branch of knowledge only after Benfey's fundamental work on Pancatantra, the collection of Indian fairy tales. It is one of the peculiar features of the Indian mind, that it has never drawn a clear line of demarcation between purely artistic creation and scientific activity, so that a distinction between 'Belles Lettres' and 'Scientific Literature' is indeed impossible in India. What appears to us as a collection of fairy tales and fables, is considered by Indians as a text book of politics and moral. 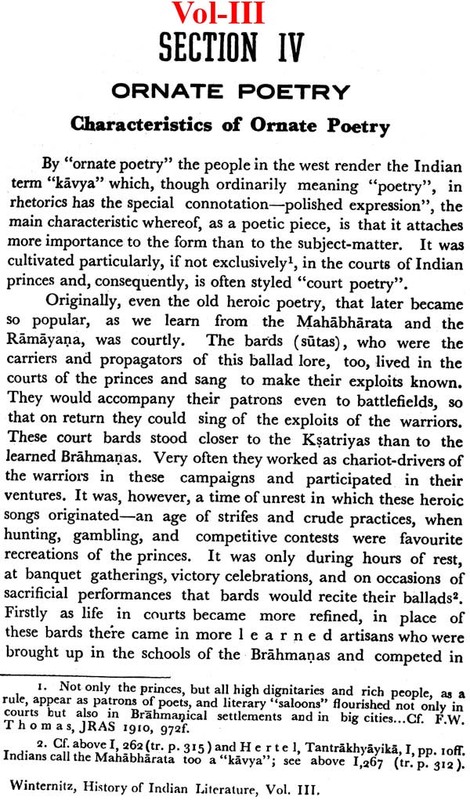 On the other hand history and biography have never been treated in India except by poets and as degenerate epic poetry. Differentiation between the forms of poetry and prose is also not known in India. Every object can be treated equally well in verses as well as in prose form. We find novels which are different from the artistic epics only in this, that they do not have a metrical form. There is a special preference for mixing prose and verse from ancient times. 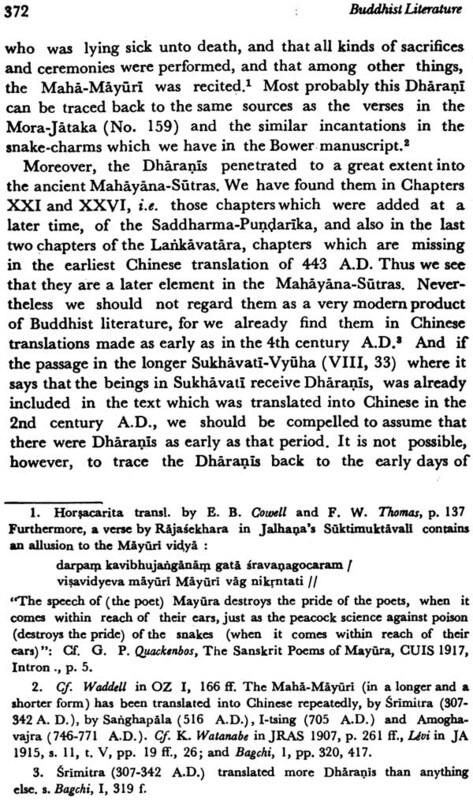 And for what we call scientific literature, the prose form was used in India only to a small measure and to a very large extent only the verse form has been used. This is true of the works of philosophy and law as well as those of medicine, astronomy, architecture etc. Indeed even grammars and dictionaries have been written by Indians in metric forms. Perhaps nothing can be more characteristic than the fact that there is a big artistic epic in 22 chapters which serves the express purpose of illustrating and stressing the rules of grammar. Philosophy has been in India even from early times, object of literary work - of course at first as a continuation of religious literature, but later even independent of it. Similarly even in very olden days law and moral - of course as above at first in connection with religion - was made the object of an independent literature of law, composed partly in verse and partly in prose. Even today distinguished jurists and sociologists esteem the significance of this literature of law for research of comparative law and for sociology. 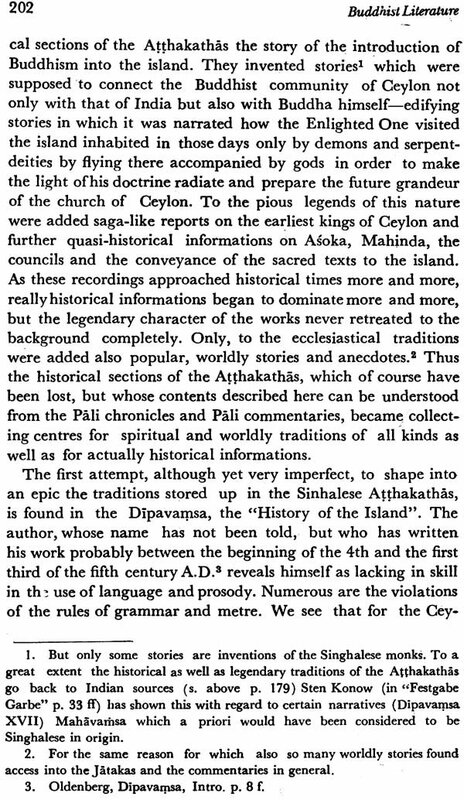 Even centuries before Christ's birth grammar was studied as a science in which Indians by far surpassed all other folks of antiquity. Lexicography also attains a ripe old age. 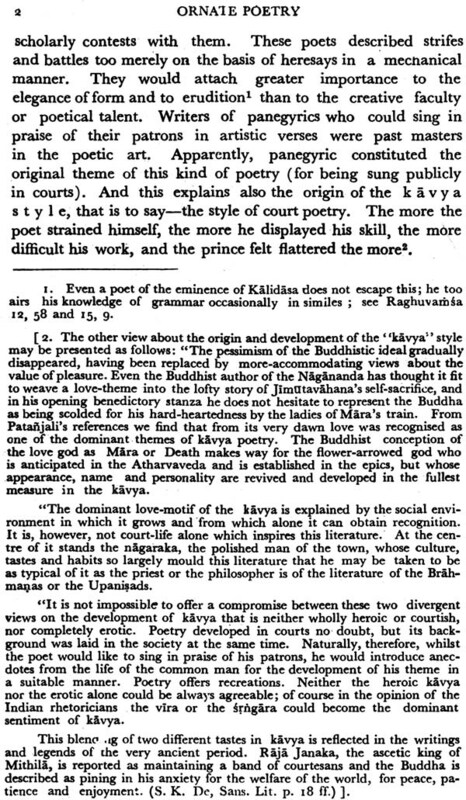 Indian poets of artistic poetry of later times have not sung what God gave them, but they studied the rules of grammar and looked up in dictionaries for rare and poetic expressions; they composed according to the teachings and rules that were laid down in scientific works of metre and prosody. 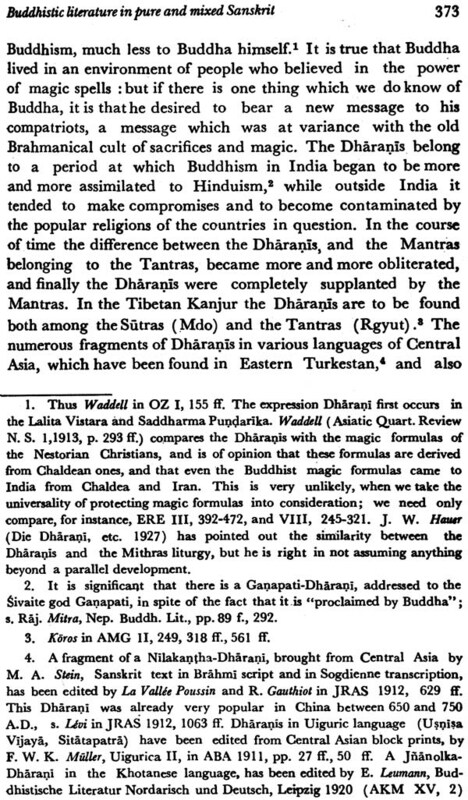 The Indian mind had always a special preference for classifying and treating all objects in a pedantic scientific way. Hence we find in India not only a rich and partly ancient literature on medicine, astrology and astronomy, arithmetic and geometry, but also on music, singing, dancing and the art of acting, magic and mantik, indeed even erotics have been reduced to scientific systems and have been treated in separate text books. author has written a commentary to his own work. Thus it is no wonder that the whole mass of Indian literature is almost unmanageable. 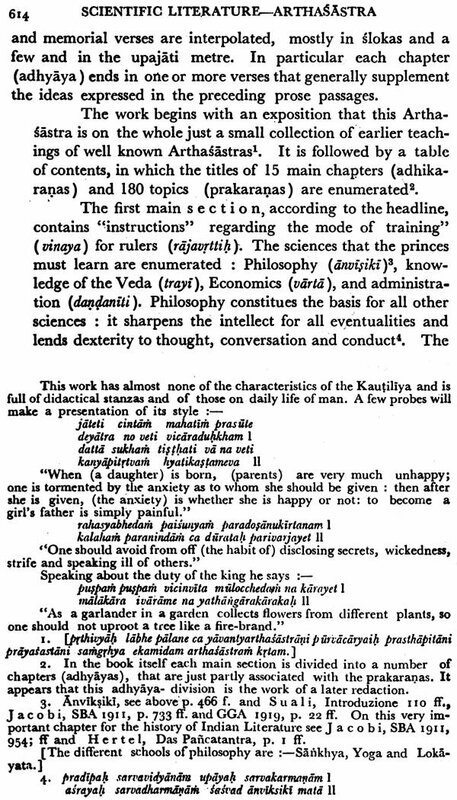 And although the lists of Indian manuscripts which are available in Indian and European libraries contain many thousands of book titles and authors' names, yet numerous works of Indian literature have been lost and many names of ancient authors are known only through quotations by later authors or have fully disappeared. When 23 years ago I undertook to write a "history of the Indian literature" and had begun to work on its preliminaries, I hoped to be able to complete the work in one volume in about three to four years. But the more I dived deep into the subject, the mass of available materials heaped up the more and this increased the difficulties of shifting them. And thus the work, that was planned to cover a single volume, has now be- come one of three volumes, and parts of this book appeared at considerable intervals: 1904, 1908, 1913, 1920 and here is the last volume at the end. Now after the work is concluded, nobody can be aware of its shortcomings and imperfections more than its author himself. But in case I had wished to let it go into the world, these faults were mended, I would have to wait still for not less than 20 years. In particular I feel and have always felt the obvious deficiency that I have prepared a history of the Indian literature in a very limited measure. But the hard fact remains that we do not possess any trustworthy information about the oldest and most important works of Indian literature, and whatever we can say with regard to the antiquity and origin of the earliest religious and secular poetry as well as about the beginning of the scientific literature is nothing but hypothetical, and naturally many readers will be disappointed to find in my history of literature so few definite statements on . chronological topics. fact, I have been accused by a critic of having used expressions like "probably", "perhaps", "apparently", etc. at too many places. In case everything in the history of Indian literature had been fully clear it would have been easy to create an impression with discussions supported by more or less definite figures with regard to dates. 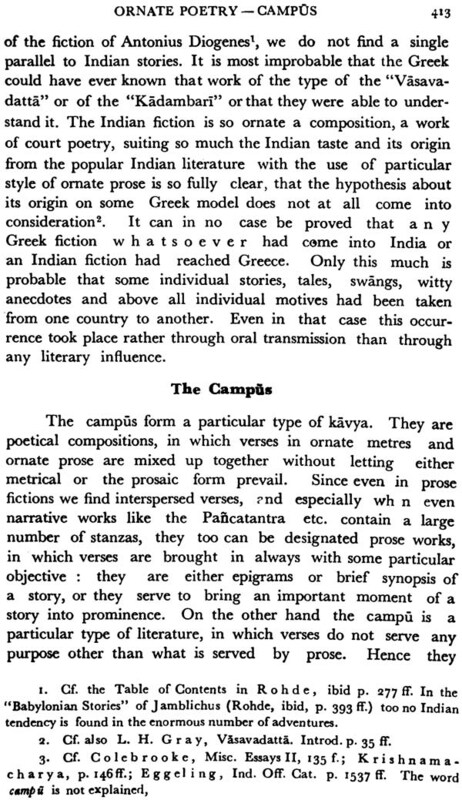 But I believe that even a layman derives more benefit when he comes to know about the meagreness of chronological data in Indian literature than when one leads him into the hamlet of Potemkin. And for the beginners, who may choose to undertake research in Indology - they will need consulting this book the most, since it is of great importance [at this stage of study] to be able to distinguish accurately between definite and indefinite statements in order to arrive at the points at which further researches have to be carried. For this very reason, I have stated in the footnotes the views that I do not participate in. 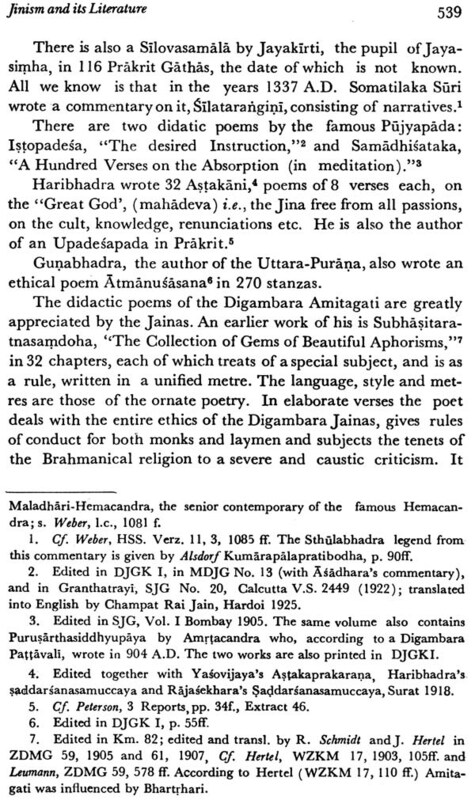 Since in respect of the history of literature I was obliged to keep myself within the limits of possibility, I have most vigorously exerted my efforts to provide the reader with most unambiguous representations of every type of literature and literary works and to introduce him assuredly of an insight into the spiritual creations of India. In order to check the work from becoming still more voluminous I had to keep myself within the limits of literature, though at times it is equally difficult to separate the history of religious literature from religion and to associate the history of culture with the history of literature. Likewise the history of scientific literature, treated in the last section, can hardly become a history of the sciences. It is natural that during the period of several years that have gone by after the publication of the first part of this work our knowledge has advanced further. So I have tried to make the work up-to-date with the addenda and corrigenda given at the end of this book of Since a greater part of the third volume was already printed by the end of 1920 it has become necessary to add even to this part the addenda and corrigenda, especially when for the first time quite a large number of works, so particularly the last volumes of the "Harvard Oriental Series", and the "Encyclopaedia of Religion and Ethics" and the "Indian Antiquary" for the years 1914-1922 became available to me at the last moment of completion of my work.